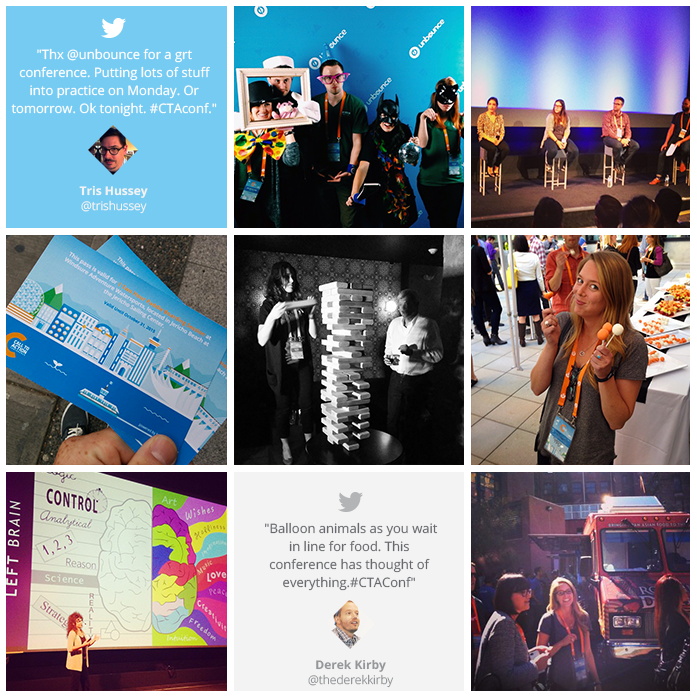 The Call to Action Conference (#CTAConf for short) is back for round two and is going to be bigger, better and even more action packed than last year. Get your umbrellas ready (just kidding, we’ve ordered only sunshine!) and join us from September 13th – 15th, for a conference experience you won’t forget. We’re extending the conference to two days instead of just one. You asked for it and we want to spend more time with you. It’s a win-win. With an extra day we’re able to double the amount of world-class speakers and deliver you even more amazing content. Take a deeper look at the killer speaker lineup in this blog post Announcing the Call to Action Conference by Oli Gardner. There’s a new location. This year we’re hosting the conference at one of the most beautiful and interesting locations in Vancouver. Granville Island! It will be nothing less than awesome. Fun adventures! Whether you choose to go bungee jumping or take a relaxing beer tour in town, we have some awesome Sunday activities in store for the day before the conference. We’ll continue to deliver the highest quality actionable content to you. No questions asked. As the event grows we’ll maintain the intimate feeling that’s been present since year one. You’re why we do this and we’ll continuously strive to make you feel like you are part of the CTA Conf family for years to come. Attention to detail. We have some tricks up our sleeves and are pouring all of our creativity into making sure you have the best time ever at this event. This conference is for you, if you’re a marketer looking to further improve your online marketing campaigns. From A/B Testing, PPC and landing pages to copywriting, conversion optimization and design; we have an amazing speaker lineup that guarantees you’ll leave with highly actionable content that you can implement as soon as you get back to work. Couldn’t make it last year? Here’s a recap and a glimpse into what you can expect to see at CTA Conference this year. We’re super excited and ready to knock your socks off for a second time around. Can’t wait to see you in September!